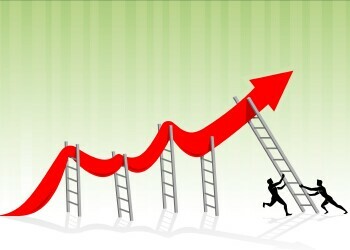 The Chicago real estate market just had it's largest annual percentage home sales increase in 16 months. July was up 4.1% from last year but I'm really not impressed. 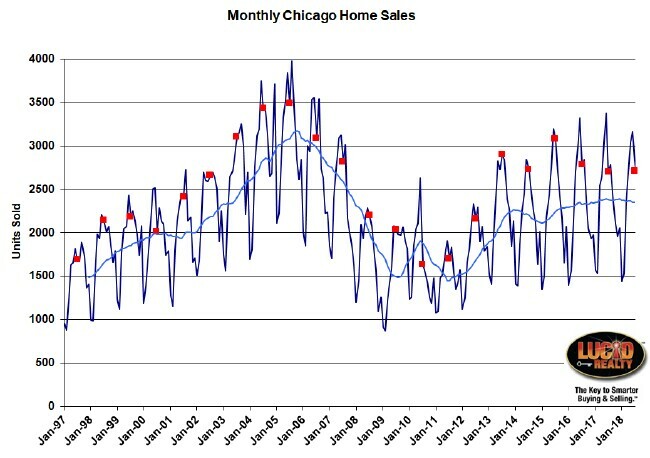 The graph below shows monthly Chicago home sales going back to January 1997 with all July points flagged in red and a light blue 12 month moving average. Even though July is going to be higher than last year it will probably also be lower than 3 of the last 5 years. In addition, if you look at the light blue moving average you can see that it is clearly trending down and I think that is a better indicator of the health of this real estate market. The Illinois Association of Realtors will report on Chicago area home sales in a couple of weeks. As always, they will report even lower sales as a result of the weird (and incorrect) way that they do their comparisons. They will report somewhere around a 1.1% increase. When we look at contract activity in the graph below we see pretty much the same story. 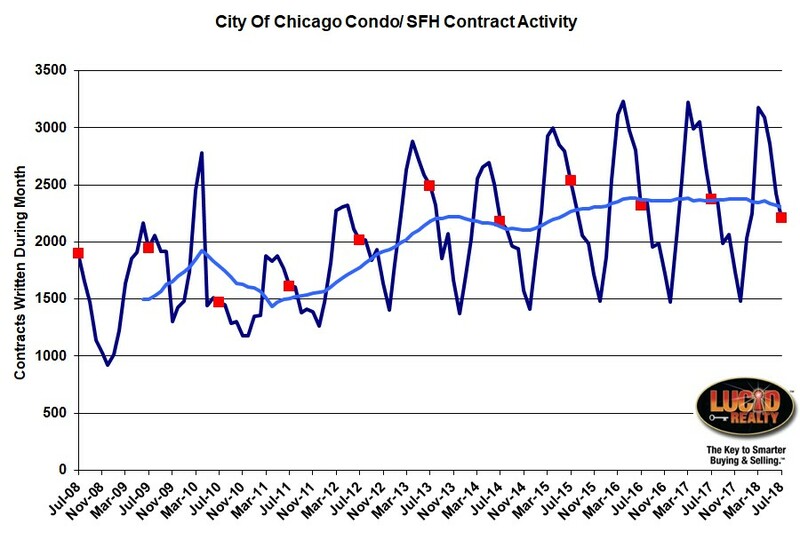 5 of the last 6 months had lower contract activity than the previous year and the moving average line is trending down. I'm estimating July at 6.9% lower than last year. Since contracts lead closings by about a month or two this means we are likely to see more weak closings for at least the next couple of months. And it's not like the pipeline is filled with a lot of pending home sales to supplement the closings. That pipeline has been shrinking for months now. July only had a 1.54 month supply of home sales compared to a 1.83 month supply last year. That's actually a pretty big decline. 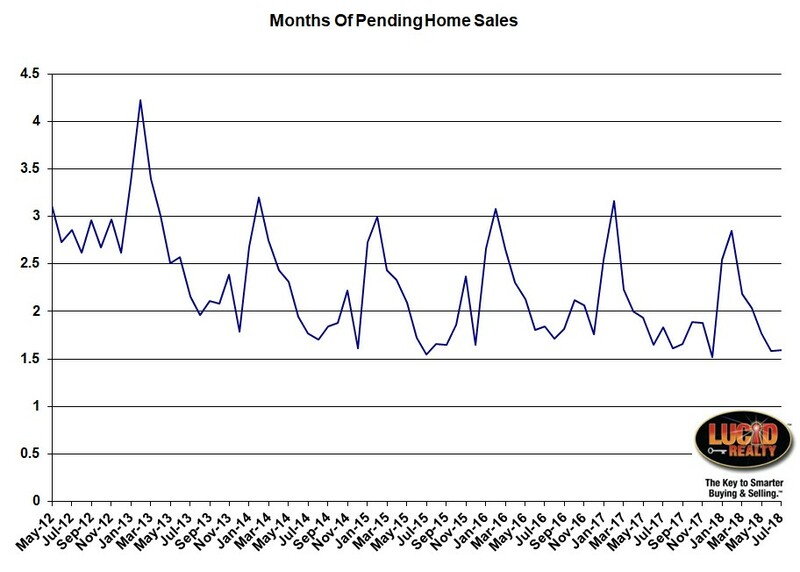 I've got the months supply of pending home sales graphed below. 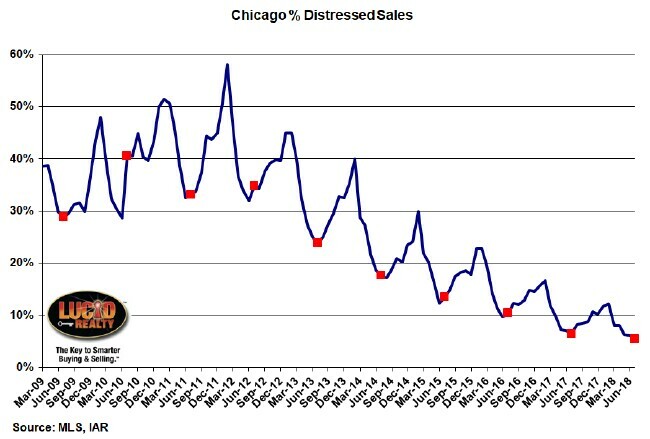 As far as the percentage of Chicago home sales that are distressed goes we are well into the single digits now as you can see in the graph below. We have been steadily declining but obviously the decline has no choice but to slow down since zero is the lower limit. July only had 5.5% distressed sales compared to 6.5% last year. Well, as you might expect, the culprit behind slow sales is quite probably the inventory situation. We continue to hit new lows in homes for sale on a months of supply basis. However, it's interesting to note that while detached home inventory has dropped dramatically in the last year - 3.9 months, down from 5.2 months - attached home inventory has actually ticked up to a 3.9 month supply from 3.5 months last year. And you can see in the graph below that for the first time since 2012 the two types of homes are at the same level of inventory. So, based on the inventory situation, you would expect detached homes to be selling quicker and attached homes to be selling slower. Well, that's not exactly what's happening. Attached homes are indeed taking longer to sell. In July the market time on these homes went up from 51 days to 54 days. However, despite lower inventory levels, detached homes that sold in July took 82 days to sell vs. 75 days last year. Definitely counter intuitive. We also maintain this and other Chicago area real estate market data on our Web site.